A conversation with an aquaintance revolved around the issue of artists needing to survive and the messy necessity of money/commodities to survive. 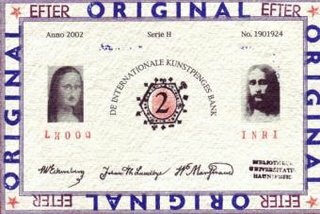 In fact, just the day before, I had been listening to an interview on the CBC on the subject of “art money“, essentially making transactins using artworks as currency. This grassroots movement takes the concept of bartering to a whole new plane. This really is an extension of something I had heard about a few years ago in a documentary about an American who would offer artworks which were drawings of money. The FBI and Treasury Department investigated him but could find no fault with his essentially trading obvious works of art for goods. Counterfeiting is passing off fake currency as real currency by means of deception. In fact, he made it clear that these were works of art and no one could be fooled into thinking that they were anything but artworks. Some time ago, a number of people from the H2G2 site and I were participating in a series of projects in which one of us would create a piece of artwork and pass it along to others who would add their own touches to it. It was a lot of fun. When a friend from YouTube mentioned The Exquisite Corpse to me, I was thrilled. I have signed up and hope that I will soon be receiving a section to work on, myself!